.... He lost all hope in civilization's progress or humanity's capacity for self-redemption. This loss of hope affected him not only ideally, but personally too. His acute disillusionment threw him into the arms of God. He converted to Christianity in 1927 having become convinced that redemption for persons or peoples had to be in Jesus; the only one in whose historical dying and rising any actual redemption had ever actually happened. Christ was the only one in whom water had ever sprung from a rock. 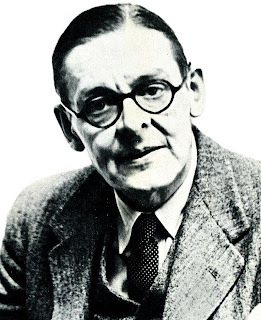 Following his conversion, Eliot's poetry and plays took on decidedly religious tones. Most significant of his post-conversion works was The Four Quartets written in 1943 amidst yet another World War. By the time Eliot wrote it, he had come to the conclusion that authentic faith must occur according to the pattern set forth by Christ himself; namely, dying (figuratively as well as physically) in order to fully live. Eliot advocated a descending road to redemption. For Eliot, the end of the descent was that place where all hope in self or others was lost. Entering into a deep darkness of hopelessness forces an awareness of our sinful presumptions and powerlessness. This final darkness, deeper than mere doubts or disillusionment, is what is colloquially meant when we speak of hitting rock bottom.
. . . In my end is my beginning. . . . The end is where we start from. Help me Lord for death is near. If one accepts this direction then holy than thou reations disappear and the total rest for redemption is the croos.